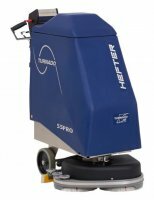 For your professional floor cleaning needs, we at HEFTER cleantech recommend a high-quality scrubber dryer that is perfectly suited to your requirements and that is equipped with special technology we developed ourselves. 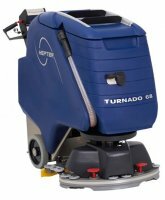 Our range includes compact floor cleaning machines such as the TURNADO® 35 and the TURNADO® 55 SV, which is especially suited for swimming pools. 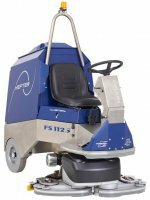 We also feature large ride-on cleaning machines such as the FS 112, which can theoretically clean nearly 9,000 m2 per hour. 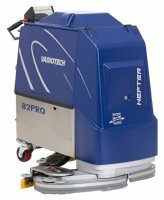 Thanks to our special technologies, we can offer floor cleaning machines that make floor cleaning not only easier, but also more efficient and economical. Our TURNADO® technology is characterised by a scrubber/suction head that can be turned from 200° to a full 360°, depending on the model. 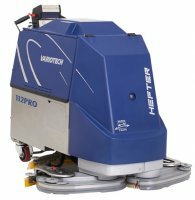 This allows for floor cleaning in every direction – even when reversing – which considerably shortens the cleaning process. Our patented VARIOTECH® technology has a similar effect. With its help, the width of the scrubber/suction unit automatically adjusts itself to the profile of the surface being cleaned. Even difficult-to-reach areas are cleaned very easily. Total cleaning costs are reduced by up to 30% thanks to the use of VARIOTECH® scrubber dryers. Our CONVERT® 82 amazes customers with the multifunctionality of its carrier system. 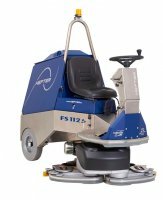 Thanks to our CONVERT® technology, various units which are used for scrubbing-drying, polishing and sweeping, as well as crystallisation, can be exchanged very simply and quickly, meaning investment in separate floor cleaning machines is reduced. In order to make it possible to operate around the clock, our floor scrubber machines use the QUICK-CHANGE® principle which ensures batteries can be changed in just minutes. Do you have questions about our technologies or various scrubber dryer models? The professionals at HEFTER cleantech will be happy to help you find the perfect floor scrubber for you.